Comedy Bar has opened a second stage, and established comedy outfits are decamping from other local venues to fill it. We met with some of them to find out why. Host Georgea Brooks-Hancock and judge Matt Folliott will kick off Strip Comedy in the Comedy Bar cabaret room immediately following the Super Bowl this Sunday. Photo courtesy of the Trend Collective. Sunday February 5, 9 p.m. (post Super Bowl), $5. Thursday February 16, 9:30 p.m., $5. There’ve been a lot of changes at Comedy Bar since the Bloorcourt performance venue opened in 2008. Much of that is due to a series of upgrades, like a luxurious wrap-around bar (instead of the ice-filled beer tubs with which they started); a dedicated box office line (rather than co-owner Gary Rideout Jr.’s personal cell phone); and a professional cleaning service (a nice alternative to Rideout’s initial position of “mostly not cleaning”—his words.) But the biggest change happened just in November, when the opening of a 50-seat cabaret room turned Comedy Bar into a multi-stage venue. About half the size of the original theatre space, it’s having an effect quickly: in the last few months, several troupes have moved shows in. It’s partly due to the intimate feel of the room, but it’s also because in the three years since it opened Comedy Bar has become a place much of the comedy community in Toronto has come to regard as their natural hub, whether they do sketch, improv, or stand-up. It’s working. Bad Dog Theatre recently announced a new partnership with Comedy Bar, and they cited the newly opened cabaret space a deciding factor in moving there. One benefit: stability. While out-of-town guests sometimes take up weekend residencies in the Comedy Bar’s main space, regularly scheduled shows in the cabaret room won’t be bumped. Rideout also points out that the main theatre’s size can be a financial impediment for trying new things. “There’s a lot of pressure to succeed immediately in the theatre,” he tells us. “Early on, on off nights, we took risks; after all, we incubated Impromptu Splendor here, before it moved to Theatre Passe Muraille. But now, with the cabaret, we can do all sorts of new and experimental shows,” he says. Recently, we got together with Rideout, Laugh Sabbath’s James Hartnett, and I (Heart) Jokes’ Evan Desmarais to chat more about the venue, and some of the other new shows that will be taking up residence there. Laugh Sabbath had been producing Sunday night shows at the Rivoli for years, but when an increase in the overhead cost of performing there (the comedy showcase had never been financially lucrative) coincided with Rideout’s offer to join the Comedy Bar line-up, the collective jumped at the chance. “The Rivoli was great,” Hartnett says, “but…there’s a vibrancy here, and widespread support by the comedy community; there’s people who are into comedy who’ll just come by on any given night to see what’s going on.” Rideout himself is a part of that: “He’s a comedian, so he really gets what you need, and what you’re trying to do when putting on a show,” says Hartnett. As for how the move might affect things, Hartnett goes on, “it’ll be the same show with a lot of the same people, but it’ll be revamped a bit.” They’ll be doing away with the subtitles each show used to have, and they are aiming for shorter, tighter shows. “I think he’s going to lose a lot of the time,” chortles Rideout. 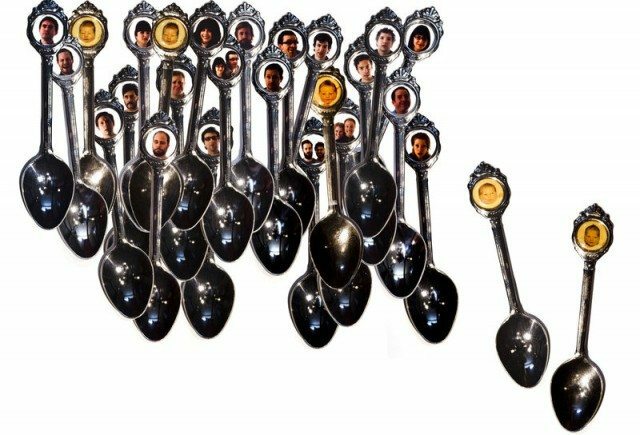 Members of the extended Laugh Sabbath family, in spoon collage form. Image by Joseph Fuda. “A lot of things seem to be happening all at once—Laugh Sabbath, I (Heart) Jokes, and Bad Dog Theatre moving in; the Cabaret space; the new open mic,” lists Rideout. But for him and Comedy Bar, it’s all part of the plan, coming to fruition.